This article is about the architectural feature. For other uses, see Gable (disambiguation). A gable is the generally triangular portion of a wall between the edges of intersecting roof pitches. The shape of the gable and how it is detailed depends on the structural system used, which reflects climate, material availability, and aesthetic concerns. A gable wall or gable end more commonly refers to the entire wall, including the gable and the wall below it. A parapet made of a series of curves (Dutch gable) or horizontal steps (crow-stepped gable) may hide the diagonal lines of the roof. Gable ends of more recent buildings are often treated in the same way as the Classic pediment form. But unlike Classical structures, which operate through trabeation, the gable ends of many buildings are actually bearing-wall structures. Thus, the detailing can be ambiguous or misleading. Gable style is also used in the design of fabric structures, with varying degree sloped roofs, dependent on how much snowfall is expected. Sharp gable roofs are a characteristic of the Gothic and classical Greek styles of architecture. The opposite or inverted form of a gable roof is a V-roof or butterfly roof. 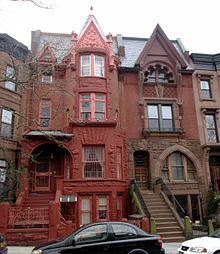 While a front-gabled building faces the street with its gable, a side-gabled building faces it with its cullis (gutter), meaning the ridge is parallel to the street. The terms are used in architecture and city planning to determine a building in its urban situation. Front-gabled buildings are considered typical for German city streets in the medieval gothic period, while later Renaissance buildings, influenced by Italian architecture are often side-gabled. In America, front-gabled houses, such as the gablefront house, were popular between the early 19th century and 1920. The cathedral in Amiens showing three portals with wimperg and pinnacles and rose window. A wimperg, in German and Dutch, is a Gothic ornamental gable with tracery over windows or portals, which were often accompanied with pinnacles. It was a typical element in Gothic architecture, especially in cathedral architecture. Wimpergs often had crockets or other decorative elements in the Gothic style. The intention behind the wimperg was the perception of increased height. The gable end roof is a poor design for hurricane or tornado-prone regions, as it easily peels off in strong winds. The part of the roof that overhangs the triangular wall very often creates a trap that can catch wind like an umbrella. Winds blowing against the gable end can exert tremendous pressure, both on the triangular wall and on the roof edges where they overhang the triangular wall, causing the roof to peel off and the triangular wall to cave in. ^ Passmore, Augustine C.. "Twenty Styles of Architecture". Handbook of Technical Terms Used in Architecture and Building and Their Allied Trades and Subjects. London: Scott, Greenwood, and Co., 1904. 360. Print. ^ "Gâble (wimperg)". A Glossary of Romanesque Architecture. Retrieved 12 October 2015. ^ Grazulis, Thomas P. (1993). Significant tornadoes, 1680-1991. St. Johnsbury, Vt.: Environmental Films. p. 106. ISBN 1-879362-03-1. Pugin, Augustus. A series of ornamental timber gables, from existing examples in England and France of the 16th Century. Wikimedia Commons has media related to Gables. Look up gable in Wiktionary, the free dictionary. Chisholm, Hugh, ed. (1911). "Gable" . Encyclopædia Britannica. 11 (11th ed.). Cambridge University Press. p. 380.